Figure 5 (A) Coronal reformation of thoracic CT scan of 40-year-old woman who received a double lung transplantation 10 months previously. She developed stenosis at the right bronchial anastomosis site (arrow). (B) Virtual bronchoscopy image created by surface rendering method shows the patent distal trachea and proximal right (black star) and left (white star) bronchi. Incidental note of pneumothorax on the left on corresponding axial CT image. The right and left sides are inverted as though one is viewing the airway in a simulated bronchoscopy. (C) Virtual bronchoscopy image through the narrowed upper lobe bronchus (curved arrow) shows patency of the segmental bronchi beyond the level of stenosis. (D) Virtual bronchoscopy view at the level of the bronchus intermedius shows the lower lobe superior segmental bronchus is angled inferiorly (arrow); the basal segmental bronchi (double arrow) are within normal limits. 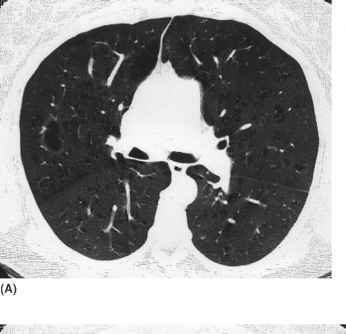 Figure 5 Continued in the hila from those in the mediastinum is essential in staging patients with lung cancer and distinguishing those who have surgically resectable from non-resectable tumors. By rotating images and visualizing them in simultaneous three-dimensional and multiplanar formatting, VB can help radiologists better identify the exact location of enlarged lymph nodes. This ability to better map abnormal mediastinal and hilar nodes, as well as noninvasively guide the bron-choscopist or surgeon to biopsy these abnormal lymph nodes, is a feature which can have a significant impact in improving the radiologic evaluation of patients with lung cancer. Other clinical uses for VB include the preoperative measurement of the airway caliber prior to the placement of special endobronchial tubes or stents [25,26] and assessing airway diameter in conditions such as stenosis, prior tracheal reconstruction, and lung transplantation (Fig. 5) . In summary, recent advances in CT imaging technology have facilitated and popularized multiplanar and three-dimensional imaging of the body. In the thorax, three-dimensional VB has evolved into a useful imaging tool. 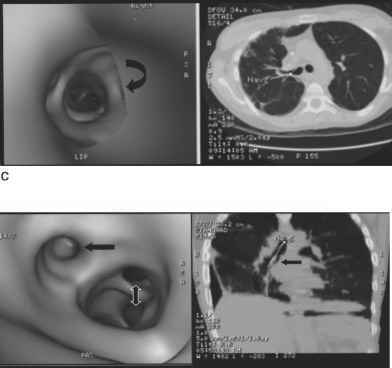 The ability to navigate through the airway lumen in a simulated bronchoscopy provides the imager with a better appreciation of the presence and extent of airway disorders and their relationship to other mediastinal structures. As a means of displaying thoracic anatomy, VB is both an excellent teaching tool and an effective means of evaluating the airway prior to interventional procedures.